My cousin, Cindy, texted me asking “wanna go to Guatemala”? Not one to say no to a new destination, I answered “yes” immediately. Cindy was returning to the country where she and her husband adopted their son, Luke, 14 years earlier. Curious about his culture, Luke expressed interest in seeing his birth home and learning the language. I flew in from San Diego. Cindy and Luke arrived from Philadelphia. We met at the Guatemala City airport. 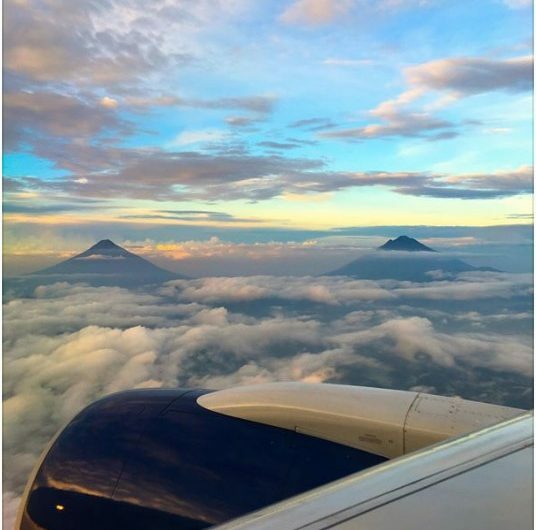 The spectacular view before landing was of two volcanos. I was going to hike a volcano the next day, just not one of those. Pacaya was our volcano . Cindy heard it was a fun hike and booked a guide for the three of us. She’s correct, it was a blast! We eagerly hiked Guatemala’s 8,737 foot beast. Lush trees & shrubs lined the ascending ash covered path ??? ???. At the top the landscape was only volcanic rock. Pacaya last erupted in March, 2014. We saw a few puffs of smoke waft from the crater? ?. Guides must accompany those climbing the behemoth. That’s a good thing ?. I can’t say enough how kind the Guatemalan people have been. 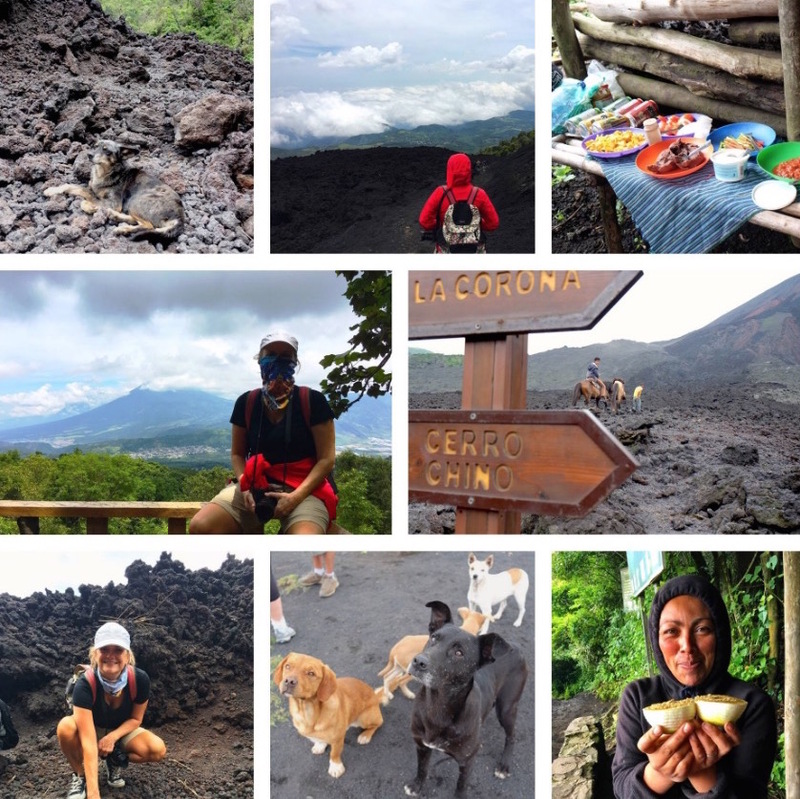 Sunday’s Pacaya volcano hike was our inauguration to the patient, sweet locals. Our guides, Wilbur and Erwin, have summited the peak more than 1,700 times. Yet, they walked at a snails pace beside us tres Americanos as we huffed our way through the thin air, all the while telling us about the surrounding flora and their culture. Halfway to the top was a fruit stand. For one Quetzal (13 cents) a woman peeled an orange, cut it in half, and sprinkled it with crushed, toasted pumpkin seeds. SO delicious! She and her family carry the produce to the hut every day! We were surprised at how many stray dogs were on Pacaya. They follow climbers and catch any food remnants thrown on the ground. The guides provide snacks for them, too. Some of the sweet perro’s markings blend in perfectly with the volcanic rock making it difficult to see them . Cindy, Luke, and I are animal lovers, so when we roasted marshmallows with the heat from crevices in the volcano we feed them to the pups . Plus, our buffet lunch inside a makeshift stick structure was a popular place for the four-legged foragers to hang out . For hikers too tired to scramble down the volcanic scree to the bottom of Pacaya, equine “taxis” were provided. We opted to walk; it allowed us to stop and take in the gorgeous views. While in Antigua, the three of us attend Spanish school in the morning, and toured the country in the afternoon. 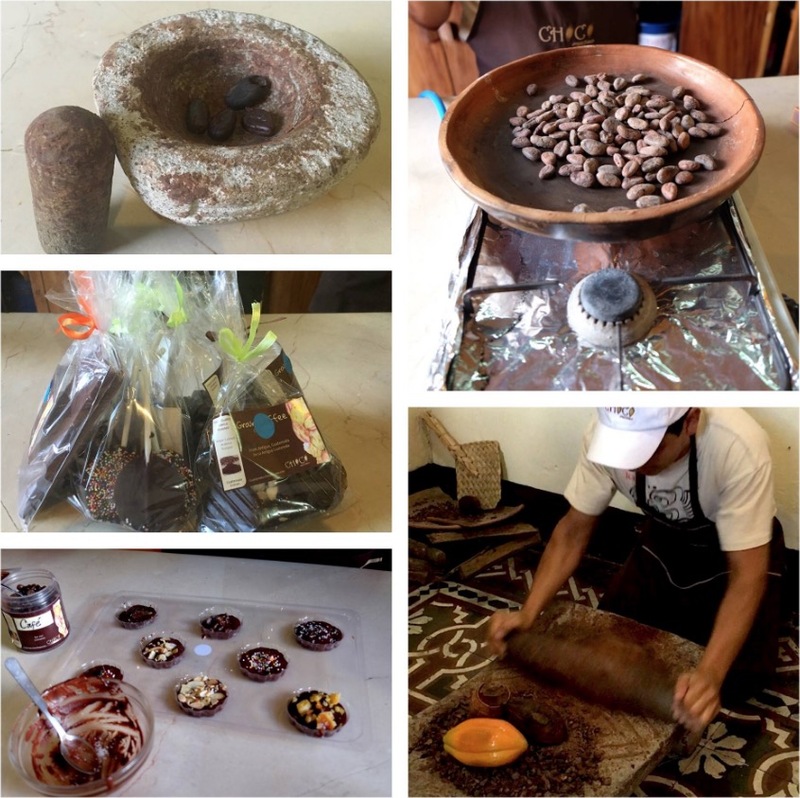 Guatemala is known for its chocolate, so what better place to learn how to prepare the elixir of life than Antigua’s Choco Museo ?. Our two hour class took us from bean to bar. Cacao was used as currency by Latin Americans many years ago; 200 seeds bought a turkey, 30 a rabbit, 1 a tomato. They’d pulverize the bean on a grinding stone, mix the paste with water and paprika, and drink. It was the Spaniards who introduced sugar into the brew, and the Irish exchanged water for milk. Not until 1847 was chocolate made into a bar. Our teacher gave each of us a handful of coco beans, which had already been removed from their pod, fermented, and sun dried. We had to roast the kernels in a clay pan until they made a popping sound. After cooling, we husked and placed them in a stone “molcajete” to pound into a thick batter. The addition of milk and sugar thinned the consistency making it possible to pour into molds. Extra goodies were provided to personalize our bars — coconut, sprinkles, coffee beans, salt, ginger, mint, nuts, etc. After 45 minutes in the refrigerator we were finito. Needless to say, they were MUY BUENO !! 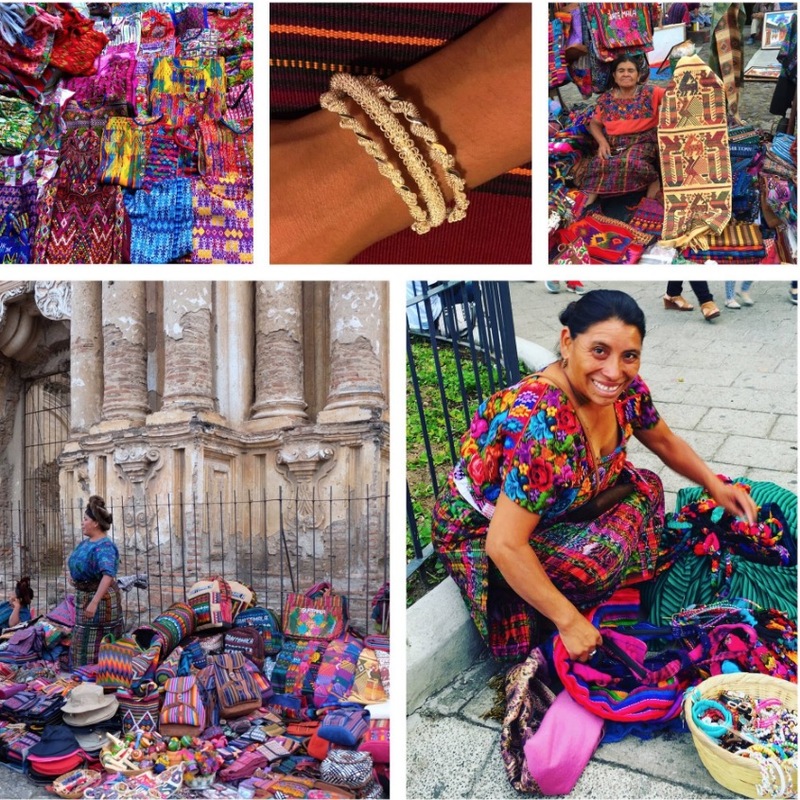 GORGEOUS woven textiles are a staple in Guatemala. Women scurry around the cobblestone streets dressed in hand embroidered garments. Tablecloths the color of rainbows adorn cafe tables. 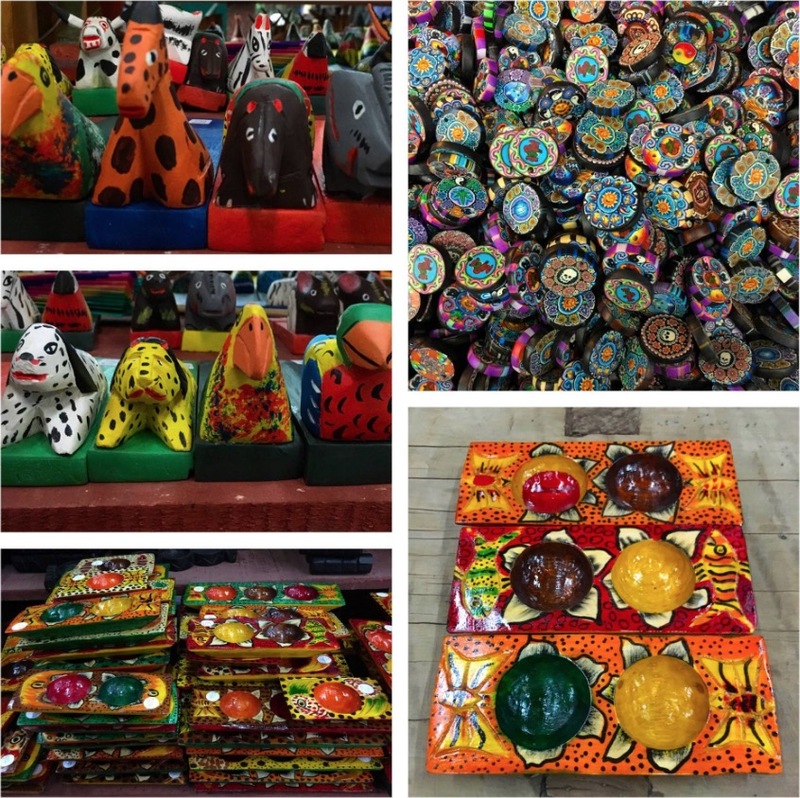 And locals sell brightly hued accessories in the Parque Central. My buddy Tami asked me to post a few of the aforementioned beauties so she can choose a few pieces to gussy up her wardrobe/house. After trolling the myriad venues selling the tapestries, jewelry. etc. I thought my readers would be interested in seeing the “art”, so I posted pics of the goodies on social media. After seeing the indigenous items on Facebook, followers ordered bracelets, spice trays, animal door stops, scarves, and more via my Global Personal Shopper page for me to bring home for them! Next stop after shopping was the coffee plantation. There are necessities in life…water, food, air, and…COFFEE! Yup, java is what keeps this world productive, whether drinking it or growing it. Guatemalans are pros at both. 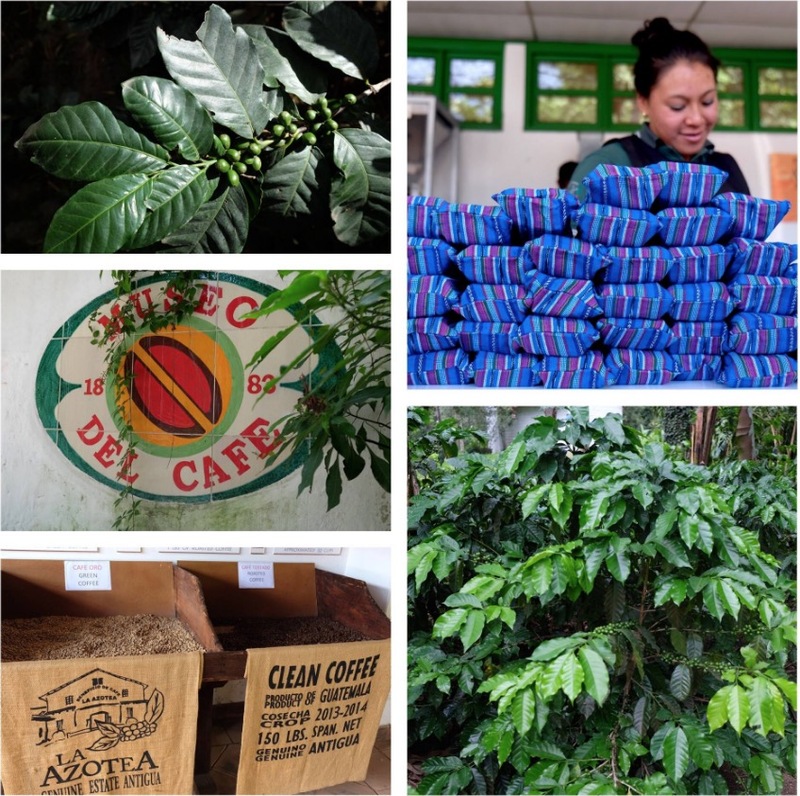 A visit to this country wouldn’t be complete without touring one of the verdant coffee farms. Luckily, La Azotea plantation, which produces half a million pounds of beans a year, is near the homestay where Cindy, Luke, & rented rooms from a local woman. Antigua’s volcanic soil and 5,000 foot elevation provide optimal growing conditions. Guatemala is the 8th largest producer worldwide (Brazil is the largest.) The labor intensive industry is grown best in a belt 25 degrees north to 25 degrees south of the equator with frequent rains. La Azotea propagates Arabica beans. During our tour, we ate numerous ones at different stages of production, fueling us for the remainder of the day…and night…and next day ?. Hundreds of bushes laden with berries as plentiful as grains of sand on the beach fill their fields. Banana trees planted among the acreage render needed shade. The green beans ripen from May to November to a red bean which is harvested over the holiday season. Afterwards, they’re weighted, separated good from bad, hulled, placed in fermentation tanks, then washed and sun dried. Employees put the roasted nuggets into woven, colorful bags, adhere a label, and ship them out to caffeinate the world ?. 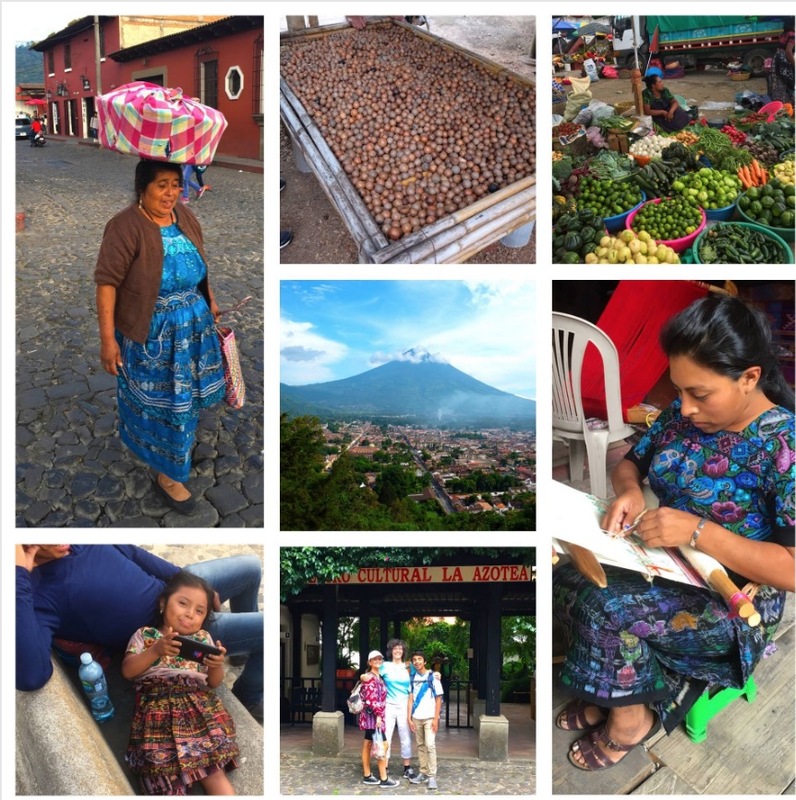 I would have loved to stay in Guatemala much longer. My week flew by. I must say, the small village at the base of Volcano Agua far exceeded my expectations. It had the warmth and feel of family so indicative of Latin countries, yet there was a European flair to the architecture. Smiles came easily from the locals as they interacted with gringos trying to speak the native tongue ?. There was a tranquility to the town; a welcome change from Southern California’s frenetic pace. Travel reveals our similarities and differences. Guate. children dressed in traditional güipil and cortes selling wares with their parents spend time watching cartoons on their cell phone like any other child around the world. On the flip side, women walk the cobblestone streets balancing baskets of freshly baked bread on top of their head ?. Antigua’s tiny UNESCO urban core is roughly a half mile by a half mile in size, but commerce is plentiful. Textiles of threads interlaced to manifest patterns of indigenous symbols or the national bird (Quetzal – same name as their currency), veggie mercados, macadamia nuts supplied by a farm we toured outside of the city, panaderias, and so on are all displayed among the ruins from buildings dating to the early 16th century. An earthquake destroyed much of the city in 1773, but remains of the principal monuments are still preserved. The highlight of the trip was spending time with my cousin, Cindy, and her son Luke. They live in Pennsylvania, so visits are few and far between. It was enlightening to see the region through a teenage boy’s eyes. Luke’s monosyllabic response to the country’s beauty conveyed just as much as Cindy’s and my five minute commentary ?. Lesson learned ?.